Generally banking is the business activities of accepting and safeguarding money owned by other individuals and entities, and then invest this money in order to earn a profit. Banks draw surplus money from the people who are not using it at the time and invest to those who are in a position to use it for productive purposes. Every bank has certain terms and conditions apply to and regulate the operation of the Savings Account Opening of an account binds the banker and customer into a contractual relationship. Every person who is competent to contract can open an account with a bank. Account Opening Form (AOF)” means, in relation to an Account or Accounts, an account opening form addressed to the Bank signed by the Client in a form specified by the Bank from time to time. 8 Documents to be submitted of the opening A/c:Private Individual (Single/Joint), Private Firm (Partnership), Private Limited Company, Public Limited Company, Club/Association/ Societies/Educational Institutions, Illiterate Person(s)/ Pardanshin Ladies/ Trustee Accounts/ Minor’s Account/ Banks, Government Officials and Military Funds. Every Business and individual has normally certain kind of transactions in line with their business/ individual needs, which is declared in the Transaction Profile (TP) of the customer. The Transaction Profile (TP) is mandatory for a client to understand his/her transactions. If needed, the TP must be updated at the client’s consent. I /We the undersigned hereby acknowledge that the transactions limit is my /our organization’s usual transactions. I/ We do hereby acknowledge that if necessary I/we will change/update the transaction profile. Transactions inconsistent with the declared TP will be considered unusual. All officials of the Bank must be alert to transactions that are inconsistent with the customer’s KYC information. If any unusual transaction is found, then the employees who have noticed it should follow the procedures to determine whether a STR should be filed or not. Disclosure –If doubt/ suspicious, report to BFIU of Bangladesh Bank through CCU. KYC policy holds financial institutions accountable for their ongoing Know Your Customer selection and initial customer selection. Financial institutions such as banks perform due diligence in verifying the identities of potential clients and keep detailed records of the process used. In the case that your institution does accidentally fund terrorists, proof of ongoing due diligence can potentially mitigate the degree of any civil or criminal charges levied against you. Must ensure that customer/entity is using their real name and not involved in terrorism or other illegal activities. Identify and verify all customers’ identities and purposes (using reliable, independent data, information, and/or source documents) to the bank’s satisfaction. Effective KYC procedures require continuous monitoring of your customer base and its normal behavior to reduce risk. High-risk accounts classified based on sources of fund or activities such as complex or unusually large transactions should undergo extra scrutiny. Banks can set thresholds for transaction amounts that deserve enhanced due diligence/carefulness. Duties / Responsibilities and Accountabilities. KYC is the Primary data base. Definition of Beneficial Owner : means the natural person who ultimate owns or controls a client and or the person on whose behalf a transaction is conducted, and includes a person who exercise ultimate effective control over a judicial person. CTR = Cash Transaction Report. Thus the Bank’s effort to combat money laundering and terrorist financing largely focuses on the process where the launderer’s activities are more susceptible to recognition and therefore concentrates to a large extent on the deposit taking procedures i.e., the placement stage. Branches must keep transaction records that are comprehensive enough to establish an audit trail. Such records can also provide useful information of the people and organizations involved in laundering schemes. Anti-Money Laundering Department & Training Institute of the Bank also deal with employees training programs which are designed to make awareness about money laundering techniques and tools etc so as to combat money laundering and terrorist financing. We see in the KYC format that there are different cells in the different tables containing risk category (High Risk Customers, Medium Risk Customers and Low Risk Customers). This arrangement is made with a view to categorize the customers in the light of risk rating and to avert possibility of money laundering, terrorist financing and fraudulent activities. If the risk scoring is more that 14 it would indicate a high risk/sensitive customer (below 14 is low risk). KYC profile and transaction profile must be updated and re approved at least annually for all the high risk/sensitive customers. Individuals (other than High Net Worth) and entities whose identities and sources of wealth can be easily identified and transactions in whose accounts by and large conform to the known profile may be categorized as low risk. 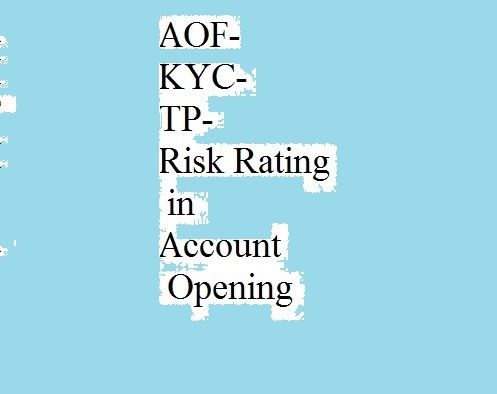 Customers that are likely to pose a higher than average risk to the bank may be categorized as medium or high risk depending on customer’s background, nature and location of activity, sources of funds and his client profile etc. Do not tip off. You should not alert the customer to the fact of the disclosure, as to do so would constitute a “tipping-off offence punishable by law.